On October 23, 2014, Commissioner Akiba represented the State of Hawaii and participated in the World Green Energy Forum 2014 as a guest speaker for a session titled “Energy Storage System-led Paradigm Shift in Electric Power Industry.“ The forum was sponsored by the Korea Energy Economics Institute “KEEI”, a national policy research institute of the South Korean government and the United Nations Industrial Development Organization “UNIDO”. Representatives from over 35 countries participated. 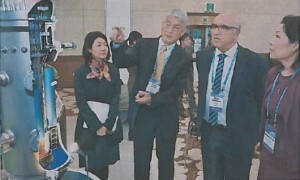 The conference was featured on the front page of the Korea Economic Daily where Commissioner Akiba is pictured. Additionally, Commissioner Akiba was interviewed for the Korea Energy Times about the global attention Hawaii is gaining in energy issues.